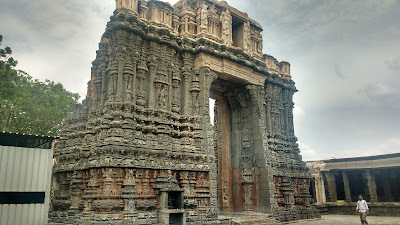 The Vijayanagara Empire flourished at Hampi and the legacy has made it a major site for the Vijayanagara school of architecture. 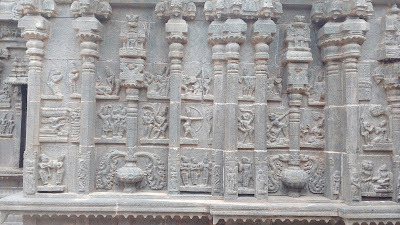 However, in terms of the striking intricacy of the sculptures, Hampi may have been beaten by the temples at Tadipatri some 200km away. 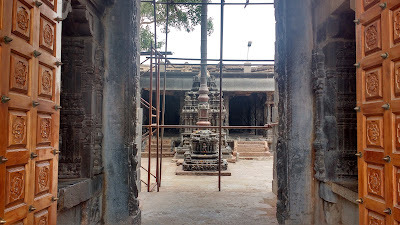 The temples here are almost contemporary to those at Hampi, but built by their Pemmasani Naidu feudatories. The town of Tadipatri is located on the southern bank of the Pennar river. The river here mostly resembles a dry, uneven depression throughout the year owing to a dam upstream. 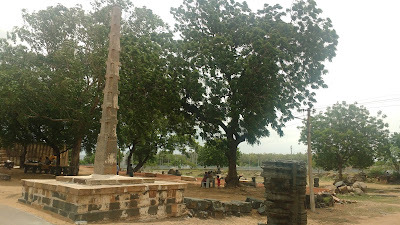 The area around Tadipatri is marked with dark depressions left behind by the quarries of Kadapa stone (black limestone). An amusing side-effect of the stone mines is that most of the shanties here are actually made of discarded slabs of these stones. The town itself is quite busy and is a centre of industrial activity in a fast desertifying area. The temples bring in a handful of tourists and/or devotees. The temples are open through the day, except for the sanctum which closed around noon - a fact I only realized when I reached there at around that time of the day. This is typical of small town temples, especially ones which are in active worship. I should've realized that earlier. Anyway. 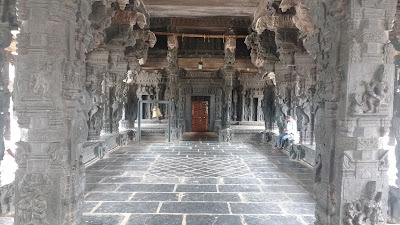 The Bugga Ramlingeshwara Temple is a Shiva temple located at the northern periphery of Tadipatri, right next to the dry bed of the Pennar. 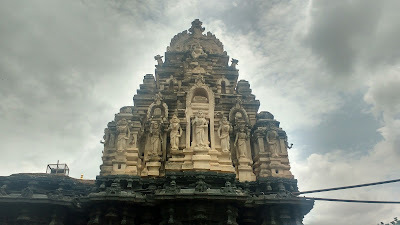 The temple is oriented in the north-south direction with one gopuram (temple tower) at either directions. The deity in itself is supposed to be of swayambhu (prophetic, self-originating) form and is fed by an underground stream (locally referred as a bugga). 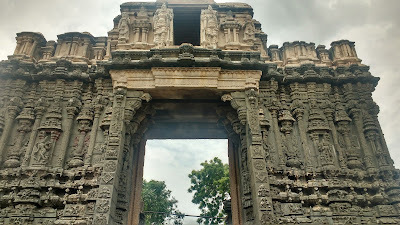 The main entrance to the temple is from the south. The temple has been constructed in the later half of the fifteenth century CE. 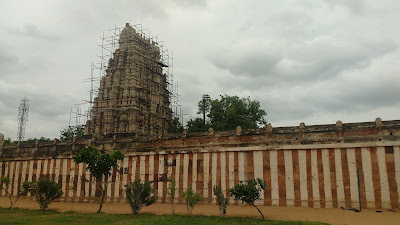 The main temple in itself is built out of the local black limestone (kadapa stone), while the spire is mostly brickwork with a creamy-yellow plaster that seems like a later addition. 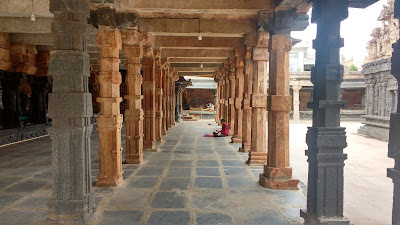 The pillars of the outer hall (sabhamandapa) of the temple feature the usual suspects of the Vijayanagara school - the cavalry. 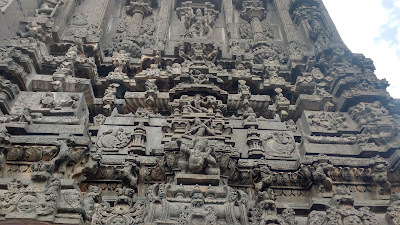 The principle attraction of this temple are the twin temple towers with their dazzling and intricate sculptures. The two towers are predominantly made up of the black limestone. The outer facades of the southern tower features brick-work and masonry which appears like a fortification. The southern tower has a roof, while the one on the northern tower is absent. The passages inside the two towers are lined with sculptures in black stone, with a few coloumns each composed of red stone that gives it a unique visual effect. This is something I'm yet to see elsewhere in India. 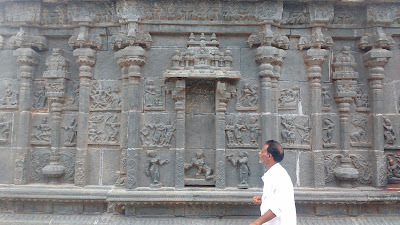 Outside temple walls, but inside the gated complex, one sees quite a few sculptures lying around. These are probably ruins from the secondary temples and buildings. 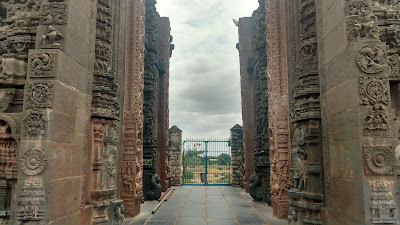 A tall pillar (garudastambha) is also seen. 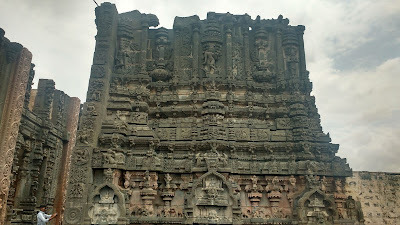 This is larger of the two temples of Tadipatri and is located inside a sprawling complex in the heart of the city. 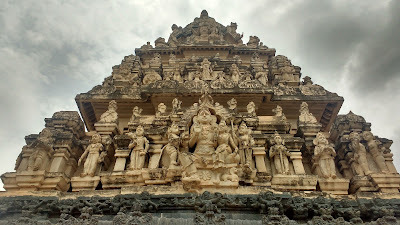 The temple is oriented in the east-west direction and has one gopuram (tower) at the eastern end. 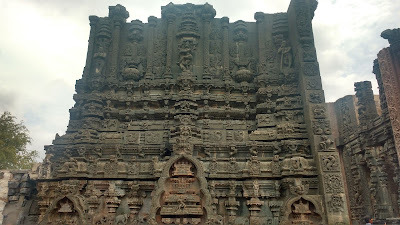 The temple itself, dedicated to Lord Vishnu, is sprawling. The overall plan sticks to the Vijayanagara school and is supposed to be very similar to the iconic Vittala Temple of Hampi. After entering through the tower, one sees a gilded flagpost, set on a beautiful stone pedestal. 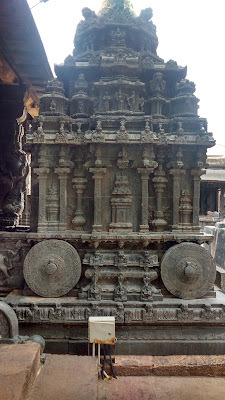 Right behind this is a chariot shaped shrine which faces into the adjoining outer hall (sabhamandapa) of the main temple. 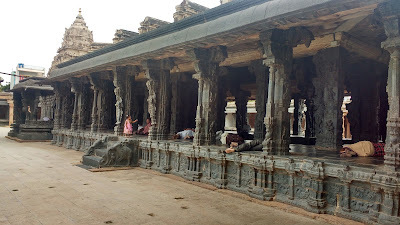 This hall is supported on pillars bearing the iconic Vijayanagara cavalry. 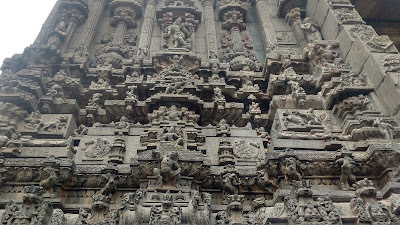 The outer walls of the main shrine is beautifully adorned, depicting scenes from the Indian mythos. 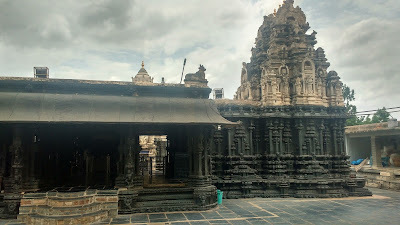 The temple is surrounded by open halls that line the walls of the complex. The gated complex has a structure for supporting weighing-scales. There is a sparse lawn that is used by the locals for relaxation. There is the toilet at the western end. The toilet is clean. 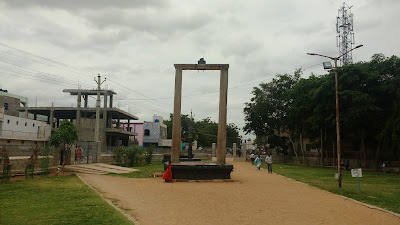 Tadipatri is one of the major towns in the Anantapur district of Andhra Pradesh and enjoys good connectivity with the neighbouring cities of Anantapur, Kadapa, Jammalmadugu and Kurnool. Anantapur offers good connectivity to Bengaluru and Hyderabad. The caves of Belum are located on the way to Jammalamadugu. 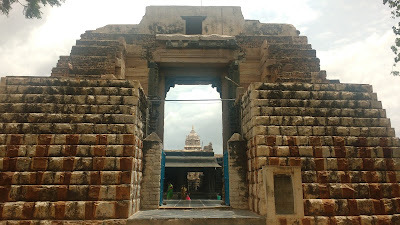 The Chintala Venkataramana Swamy Temple is located at a 15 minutes walk from the bus station. 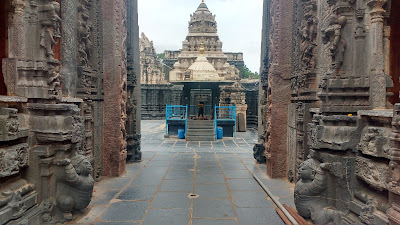 The Bugga Ramlingeshwara Temple is at a 10 minutes walk from the Chintala Venkataramana Swamy Temple. One may hire a rickshaw if one pleases.